How to Become a Better Hitter Without Even Swinging a Bat! How to Become a Better Hitter - Without Even Swinging a Bat! Last year, there was a fantastic article posted on the Baseball Coaching and Training Blog, titled, " Become a Better Hitter - Have a Hitting Philosophy." In the article, Scott M. Thompson discusses all of the things a hitter should be doing to give himself an advantage at the plate - things that have nothing at all to do with swing technique. Observe the pitcher, catcher, umpire and fielders from the bench, know what is happening on the field when you step up to the plate, be realistic in what your abilities are and change your philosophy with each pitch. Rather than goofing off with your buddies when you are on the bench, waiting for your turn at bat, really keep a keen eye on what is happening on the field. Try to pick up tendencies the pitcher has. Does he spend more time in his glove before throwing a curve? Does the catcher set up differently for different pitches? Does the pitcher's arm speed change when he throws a changeup or curve? Does he tend to always throw the same first pitch? Watch the infielders, too - especially the shortstop and second baseman. They can see the signals the catcher is giving the pitcher. Do they adjust to the left or right based on the pitch that is being thrown? And, of course, don't forget about the umpire. What is his strike zone? Does he tend to give the pitcher or the hitter the benefit of the doubt - especially on strike three? Is he consistent? You may find that you need to swing at anything remotely close to a strike with some umpires - especially when you have two strikes on you. Get your teammates involved with all of the above. Make a game of seeing who can spot a tendency. It's a lot of fun when you can spot a tendency and share that tip with other teammates! Obviously, you'll want to take everything you learned while on the bench to the plate with you. Be ready for that first pitch he seems to throw to everybody (unless you hit it good last time, in which case you can bet that you won't see that as the first pitch again) and take note of any position adjustments the fielders make each time you get set in the box. And, while you shouldn't really look at the catcher, have teammates tip you off with a signal if the catcher does anything of note before a pitch.Also be aware of the game situation. Where are the base runners? How many outs are there? With a man on first or second and no outs, you'll want to look for something on the outside of the plate and hit behind the runners. With two outs, you'll want to hit it anywhere. 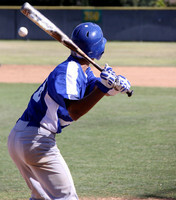 If you have a tough time with a high, inside pitch, don't swing at it unless you have two strikes against you. Your time to work on hitting the high hard one is during batting practice - not in a game! Is there a pitch that you always hit well? Wait for that pitch until you have at least one strike. It's OK to let an inside curve ball go for a called first strike if that's not your best pitch to hit. Also, never guess change up or curve ball. It's tough to catch up to a pitcher's heater when you were prepared for something slower. It's much easier to adjust to a slower pitch so always be looking for a fastball. The exception to this rule is when you have noticed something from the bench that ALWAYS gives away that a pitcher is throwing a change up or curve. When the count is two balls and no strikes, you should have a completely different philosophy than when the pitch count is 1-2. With one strike on you, adjust your thinking slightly. Instead of looking for your very best pitch to hit, start looking for anything you can hit (but don't swing at that pitch you know you don't hit well). Don't forget what you learned from the bench. What does the pitcher like to throw when the count is 1-2, when it is 3-0, when it is 3-2? And, when you have two strikes on you, your job is to protect the plate. Don't swing at things clearly outside of the strike zone, but be prepared to swing at anything close. Shorten your swing a little to give yourself a better chance of making contact.